#OptOutside began in 2015 when REI executives began questioning their corporation's involvement in the annual bargain bacchanal. Each year between Thanksgiving and Christmas, Americans generate one million extra tons of waste, a good portion of which can be attributed to Black Friday shopping. REI decided to offer a different narrative for Black Friday—one that runs counter to consumerism and the environmental harms it generates. "We think that Black Friday has gotten out of hand and so we are choosing to invest in helping people get outside with loved ones this holiday season," said president and CEO Jerry Stritzke in the letter first announcing #OptOutside in 2015. During that first #OptOutside campaign, REI partnered with 170 organizations to help get the word out and arranged for 1,000 state and local parks to waive entrance fees that day. 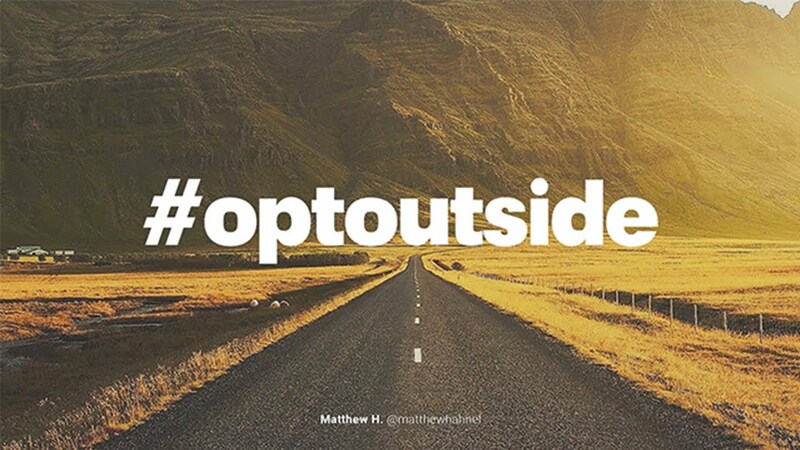 #OptOutside resonated widely—more than 1.4 million people posted on social media with the #OptOutside tag. Ad Age called the campaign the "future of marketing." After another successful campaign in 2016, REI has sought to widen the reach of #OptOutside this year with an "experiential search engine" designed to make it even easier for people to get outside. The search engine compiles thousands of photos depicting outdoor adventures that people have posted on Instagram with the hashtag #OptOutside. You can scroll through photos organized by activity, or search for outings in a particular area. If you find a photo that piques your interest—say a landscape in your area that you've never seen—you can click on the photo to find more information, including the name and location as well as the difficulty level of trails. CEO Jerry Stritzke believes the search engine unites outdoor enthusiasts in an unprecedented fashion. "We have captured the experiences of the outdoor community and organized them in a way that no one has done before," he said in a press release announcing the #OptOutside 2017 campaign and search engine. "Right now, I think people are looking for a moment to take a breath, reground themselves, and come together."